Here's why Signet Jewelers Limited, Alexion Pharmaceuticals, and Acuity Brands all posted gains of 20% or more during the month. June was a quiet month for the S&P 500. The famous index ended the month down less than 1% from where it started. However, not every company from the index had muted returns. In fact, three stocks -- Signet Jewelers Limited (NYSE:SIG), Alexion Pharmaceuticals (NASDAQ:ALXN), and Acuity Brands (NYSE:AYI) -- all rose 20% or more during the period. Here's a look back at the key news items that drove each company's share price higher. Signet Jewelers' stock rose by just over 20% during the month, but it's not entirely clear why. The company behind retail jewelry concepts Zales, Jared, and Kay didn't have any major announcements released during the period that could explain such a strong upward movement. You can't credit the gains to a short squeeze, either, as the number of Signet's shares sold short increased during the period. Given the lack of news, it's likely that the stock is simply recovering a bit from its recent drubbing. While investors should take any gains they can get, the company still has a long way to go to makes its shareholders whole. Even after including June's big jump, the company's stock is still down more than 30% since the start of the year. That poor performance is understandable, given the sexual-harassment allegations that have been brought against its management team. Could the future finally be looking up for shareholders? While anything could happen, management is still projecting same-store-sales declines for the year as it deals with declining mall traffic. That's why it remains unknown if the company will succeed at adapting to the ever-changing retail environment. For that reason, I plan on keeping far away from this beaten-down stock. Alexion Pharmaceuticals was the second biggest winner from the S&P 500 in June. Shares rose nearly 21% on the back of a few positive developments. The big news from the month was that Alexion continues to make a number of sweeping changes to its executive ranks. The company hired a new chief compliance officer, chief human resources officer, head of R&D, and chief financial officer during the month. Traders seemed particularly excited about the CFO hire, as the company managed to lure away Paul Clancy from rival biotech giant Biogen. Alexion CEO Ludwiq Hantson issued high praise for Clancy, calling him "a world-class CFO" who brings "deep experience and a proven track record" to the company. Wall Street applauded the announcement, hopeful that it signals an end to the management turmoil that's plagued this company for several months. The company's troubles began a few quarters ago, after a former employee brought forth allegations of improper sales practices for Alexion's top-selling drug, Soliris. That led the company's board of directors to launch a formal investigation that culminated in the dismissal of the CEO and CFO. Beyond the management shuffle, Alexion also announced that the European Medicines Agency has adopted a positive opinion on granting Soliris a label expansion claim into refractory generalized myasthenia gravis. This move hints that the agency will approve the expanded indication claim in the third quarter, which is a bullish sign for the company's growth. In all, June was filled with good news, so it's easy to understand why shares rallied during the month. 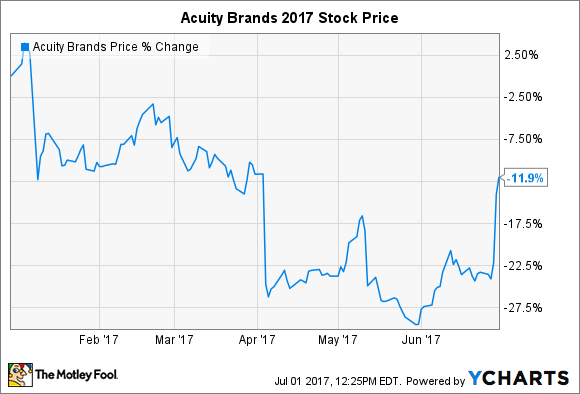 The biggest winner from the S&P 500 in June was Acuity Brands, a company that specializes in lighting solutions. Shares rose nearly 22% during the month, largely in response to an upbeat earnings report. Acuity's revenue jumped 5% during the quarter to $891.6 million, while its net income increased 11% to $82.2 million. That translated into $2.15 in adjusted EPS. These figures compare favorably with the $881.4 million in revenue and $1.98 in adjusted EPS Wall Street had expected. Like Signet, Acuity's investors have also had a rough start to 2017. Before the earnings announcement, shares had given up more than 22% for the year. Given the upbeat earnings results, it's easy to understand why Acuity's investors are feeling more confident about its future prospects. Consumers and businesses alike should continue to swap out their old lights in favor in favor of more efficient LED options in an effort to save costs. With Wall Street estimating profit growth in excess of 18% annually over the next five years, it is possible that Acuity's rally could just be getting started.